The first sign of Hodgin's lymphoma is often a swollen lymph node, which appears without a known cause. 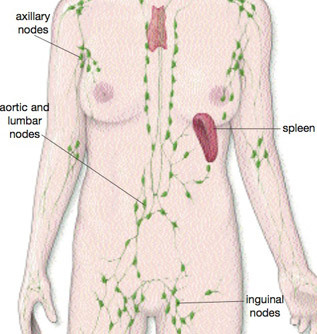 The disease can spread to nearby lymph nodes. Later it may spread to the spleen, liver, bone marrow, or other organs. The cause is not known. Hodgkin's lymphoma is most common among people ages 15 - 35 and 50 - 70. Past infection with the Epstein-Barr virus (EBV) is thought to contribute to some cases. Patients with HIV infection are more at risk than the general population. Note: Symptoms caused by Hodgkin's lymphoma may also occur also with other conditions. Talk to your doctor about the meaning of your specific symptoms. If tests reveal you do have Hodgkin's lymphoma, additional tests will be done to see if the cancer has spread. This is called staging. Staging helps guide future treatment and follow-up and gives you some idea of what to expect in the future. In some cases, abdominal surgery to take a piece of the liver and remove the spleen may be needed. However, because the other tests are now so good at detecting the spread of Hodgkin's lymphoma, this surgery is usually unnecessary. Tests will be done to see if the cancer has spread. This is called staging. Staging helps guide future treatment and follow-up and gives you some idea of what to expect in the future. Staging is necessary to determine your treatment plan. Stages of Hodgkin's lymphoma range from I to IV. The higher the staging number, the more advanced the cancer. Treatment depends on your age and stage of the cancer. Stages I and II (limited disease) can be treated with radiation therapy, chemotherapy, or both. Stages III is treated with chemotherapy alone or a combination of radiation therapy and chemotherapy. Stage IV (extensive disease) is most often treated with chemotherapy alone. People with Hodgkin’s lymphoma that returns after treatment or does not respond to treatment may receive high-dose chemotherapy followed by an autologous bone marrow transplant (using stem cells from yourself). Horning SJ. Hodgkin’s lymphoma. In: Abeloff MD, Armitage JO, Niederhuber JE, Kastan MB, McKena WG, eds. Clinical Oncology. 4th ed. Philadelphia, Pa: Elsevier Churchill Livingstone; 2008:Chap 111. Armitage JO. 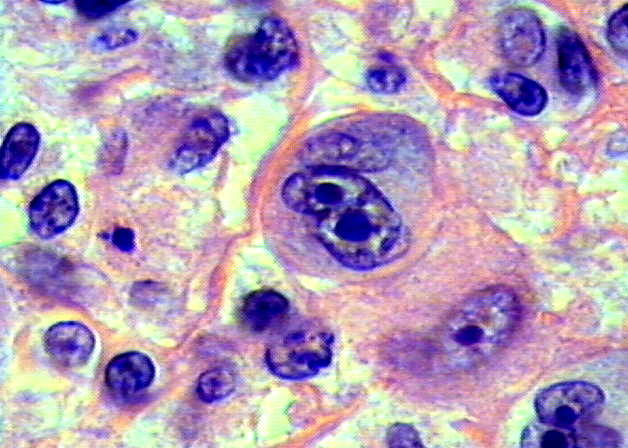 Early-stage Hodgkin's lymphoma. N Engl J Med. 2010 Aug 12;363(7):653-62.